Asphalt is is the number one recycled material in the world. Many people are under the assumption that all paving materials are terrible for the earth. However, this is not the case. Did you know that asphalt is environmentally friendly? It is an incredible material that has many practical applications in the construction industry today. Keep reading and discover four benefits of utilizing eco-friendly asphalt. Most people are surprised to hear that asphalt is one of the most recycled products in the U.S. Most of which is used in our country’s road system, which has been repurposed several times. This material can be reused over and over again through the reheating process. Some of the asphalt used on the roads today has been around for decades. One of the greatest advantages of asphalt is that it incorporates a variety of waste materials. Many building materials are hard to dispose of. When a building is demolished, concrete and other materials can be used for the creation of asphalt. As a result, fewer materials are gone to waste and put towards another practical purpose. Almost all roads in America are paved with asphalt. One of the reasons being that it possesses the smoothest driving surface. In addition to being easy to drive on, asphalt allows for the best contact between vehicle tires, which makes for safe driving conditions. Since there are fewer bumps on asphalt roads, it causes less damage to vehicles, which lessens operation costs. 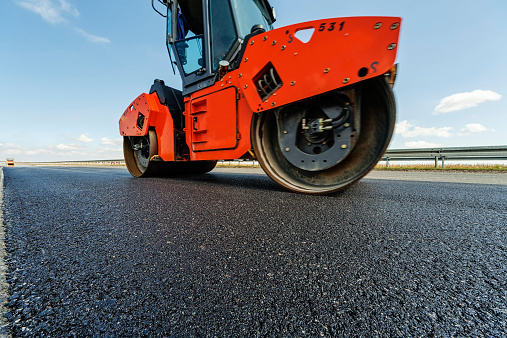 Compared to many other paving materials, asphalt projects can be completed relatively quickly. Asphalt roads are often paved a lane at a time, which helps to prevent road congestion. Some asphalt construction projects can be completed in as quickly as a day. This entry was posted on Monday, October 8th, 2018	at 3:35 pm	and is filed under Asphalt Paving	. You can follow any responses to this entry through the RSS 2.0	feed. Both comments and pings are currently closed.